Welcome to the Crazy Crafters' Blog Hop with our Special Guest stamper, Shannon Lane - we are thrilled to have Shannon join us this month and so excited to CASE (Copy And Selectively Edit) any project that has been created by her. This is Shannon's card that I have chosen to CASE. 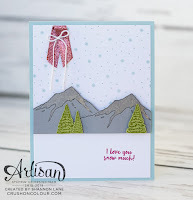 As soon as I saw the mountain elements, I thought of the gorgeous Carried Away paper in the Sale-A-Bration catalogue (free with a purchase of $90). So this is my card based on Shannon's. I cut the mountains out and glued them onto the sheet of paper with the cloud images (from the same paper pack). 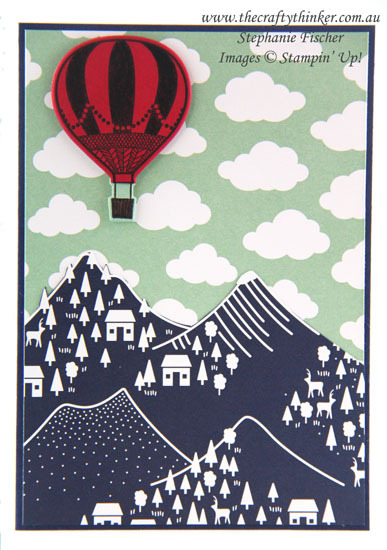 The balloon is stamped in Basic Black ink onto Real Red cardstock and cut out with the matching die (buying the stamp set and thinlits as a bundle gives a saving of 10%). To blend the balloon basket with the sky, I cut off the lower part of the red balloon and replaced it with one I had created with Mint Macaron cardstock. I used a Chocolate Chip Stampin' Write Marker to colour the basket. I then adhered the balloon to the card front with Stampin' Dimensionals. Thank you, Kim. Yes - hard to believe it's a freebie! Thank you, Vicki, me too! Great Case Stephanie :) I love how you have fussy cut around the DSP mountains! Brilliant job- what a clever case! Great CASE Stephanie. Love how you've used the DSP. Thanks, Juana. #loveitchopit :) ! Fab case!! I love this DSP! Thank you for that lovely comment, Shannon - I'm very grateful and flattered! The pleasure was all ours - it was an honour to hop with you! What a clever way to use this paper! So simple and yet so effective. You are such a talented crafter Stephanie. 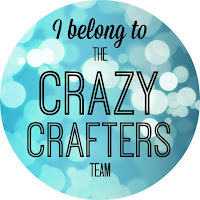 So thrilled you are part of the Crazy Crafters team. Thank you, Kylie - that's a lovely thing to say! Lovely card Steph. Would you believe that I haven't cut this DSP up yet. Thank you for the inspiration. This is great Stephanie! I love how you thought to do the basket separate to match the back ground! Thanks, Sandra! I was so much easier than cutting out the little square between the basket and the balloon!